If your idea of pure joy is a trail race involving a lot of mud, rain, stream wadings, steep and seemingly endless hills, inching through a pitch black 300 metre long limestone cave, and navigating 22 or 35 kms (depending on your degree of insanity) of slippery farm tracks, you’d have loved our recent April 28th adventure competing in the Waitomo Caves Trail Run in New Zealand’s North Island. Five runners from the Auckland Sri Chinmoy Centre recently competed in this great event and enjoyed themselves immensely, traversing the amazing limestone studded hills with their outcrops of wind sculpted stone. The spirit and power of place was overwhelming and humbling – the landscape seemed like an ancient battlefield, filled with giants and Titans and strange Beings turned to stone. Across the green landscapes and ridgelines the fists of rock reared up into the sky, resembling fleeing invaders lurching back to the sea after some mythological battle, now frozen mute and turned to stone by some fatal curse. Were they stranded there at daybreak, a raiding party from some barbaric underworld undone by the sudden dawn, or defectors from the faraway mountain fortresses seeking refuge in the dark forests? It was Lord of the Rings stuff! But the mute limestone features would not soften or speak as we passed. Mother Nature threw everything at our brave few – rain, wind, cold – but our runners relished the challenges and placed well in the event. Movement and meditation belong together. We were exulting in the freedom of wellbeing, the beauty of landscaps, the wonderful camaraderie of the running fraternity, the silence of the hills, the dance of this wonderful life. The spectacular course runs through places of cultural significance to local Maori people, and around 1400 participants with more than 700 international athletes competed this year, including some of the world’s best elite ultra runners. Cheryll was out there in the 62 km event, an 11 hour run that saw non-stop rain, around 2,000 metres of climbing and lots of muddy trails. Welcome to the 21st Annual Self-Transcendence 3100 Mile Race and one of the most remarkable races in history! Called ‘The Mount Everest of Ultramarathons’ by The New York Times, this is the longest certified footrace in the world and the 2017 event has just kicked off in New York with the first ever woman Kiwi contender. Athletes are able to test themselves in a format unlike any other ultra-marathon event. They must average 59.6 miles per day, for 52 straight days, in order to reach 3100 miles. They must run these miles between 6am and midnight each day. The surface is concrete sidewalks around a playground, ball fields, and the confines of a vocational high school, and all in a city neighborhood setting. The physical and psychological demands are prodigious, if not overwhelming. Thus, participation is limited to invited athletes who have a history of multi-day running experience and elite endurance abilities. Ten runners started the 21st running of the Sri Chinmoy Self-Transcendence 3100 Mile Race this morning at precisely 6:00 am. The concrete sidewalk course has been used the previous 20 years as a test of extreme endurance, stamina, and running ability beyond any normal realm. Founded by spiritual leader Sri Chinmoy, the .5488 of a mile course (883.2079 meters) has been the playground for ultra elites who have tested themselves by trying to run nearly 60 miles every day for 52 days. Five time finisher and 2013 winner Vasu Duzhiy from Russia led the way through the early going, but carefully avoided the heat of a sunny Father’s Day until sundown. At the end of the 18-hour day, Mr Duzhiy totalled 75.18 miles(120.99 km) to lead veteran Austrian Smarana Puntigam by five laps. Nirbhasa Magee of Ireland ran strongly in the evening to reach 71.34 miles. Kaneenika Janakova, the Slovakian champion led the ladies with 69.7 miles, just two ticks ahead of Austrian Nidhruvi Zimmermann. Surprise first-timer women Harita Davies ( New Zealand) and Yolanda Holder also did well with 68.05 and 60.36 miles, respectively. One of the really wonderful features of our spiritual path is the focus on physical wellbeing, especially running. I’m truly grateful that here in Auckland we have so many wild and remote places – rough and edgy mountains, indigenous forests, lovely stretches of coastline – that offer peace and solace and a refuge to the spirit. Cradled in this spirit of place, these landscapes and seas and skies, how can we not feel gratitude on some morning run when we venture down a wilderness of beach that stretches out to a far horizon. This week has been ‘aspiration week’ in our centre in Auckland, an invitation to each of our members to set and reach new goals, enjoy open nights and new activities and generally rekindle our aspiration. This morning two of us met up at 5:15 am and drove through a wet and rainy pre-dawn gloom to a large area of forest on our west coast – a tract of pines and native forest inhabited by deer, the odd wild boar and lots of small wild life. We ran along the blackness of roads, the sound of the sea in our ears and light rain on our faces, then as darkness receded ventured into the forest, on to the narrow game trails that wind for miles through these hills. We felt like indigenous man, exulting in an almost primeval sense of well-being, all the artifice of civilization gone, jubilant in the simplicity of life itself and the joy of being. I like these hours wandering in a garden of ridges and valleys and effortless beauty, hearing the water in the streambed below and the language of the forest all around. In the early light the air is filled with teeming embryonic life, millions of tiny spores drizzling from the green fronds of the mamaku and the waist high thickets of ferns – I breathe them in joyfully. We need whatever it is these sanctuaries provide. Untamed nature can be a harsh learning place but also a great schoolroom of self-knowledge – and here where the wilderness of nature and the wild places of the mind intersect, we are often undone. Life and death experiences, moments of fear, a day or two lost and alone and far from help – such things that our modern world so carefully shields us from are treasures that never leave our memory, moulding us without gentleness or pity. Our ‘self’ is pared away and we are opened up to the capriciousness of life and death, only a moment of chance apart, and to the primal fears and trapdoors that open in the wild places of our minds. Nature is a repository of many potential experiences that ground us and make us better, more complete – and here, as in meditation, all our sensibilities converge toward new insight and discernment. Cut off from all this, we become less human, less civilized. It’s 2am and I’m in an all-hours gym, hurtling through some hi-intensity workout sessions on rowing machines, leg curls, a squeaky cross trainer. No one else here, everyone’s abed. The gym manager’s favorite music is on a repeat loop in the background and I’m hearing “I’ve seen fire and I’ve seen rain” for the tenth time, a James Taylor recording awash with memories. Why does physical exertion always make us feel so good? On the TV screen a rerun of the recent marvelous attempt to run under the 2 hour marathon mark — Eliud Kipchoge, Lelisa Desisa and Zersenay Tadese are trying to become the first human beings to do the seemingly impossible. The attempt, known as Breaking2, has drawn plenty of attention since Nike announced it back in December, and since then we’ve heard all about the course (a Formula One track in Monza, Italy), the shoes (custom-made Nike specials) and the strategy on how the attempt should play out. Six lead runners and pace makers are in a V-formation in front of the hopefuls and charging away into a 4:35 first mile that I could never have kept up with, never ever. It’s beautiful to watch, the thrill of their grace and speed and power, the fastest humans on the planet, their energy flooding my body with inspiration. I’m flying on the treadmill, a 4:35 mile in my parallel universe..
Years ago, sports lover and spiritual master Sri Chinmoy said the 2 hour barrier would be broken, and not too far in the future. Of the four qualities he said were needed, only one relied upon physical training. The others were about the mind and spiritual heart, receptivity to grace, gratitude, access to the power of the inner life which can flood the body with power – realities often spoken of by lead marathon contender Kipchoge. Carl Lewis, nine times an Olympic gold medallist, is there on the screen, talking us through some of his insights. He’s excited – he knows that this is hugely significant, history’s in the making, the marathon is all about humanity transcending itself. He talks about the marathon as metaphor, it’s relevance to every human being: we all have our barriers and limitations, but if we dare to try they can tumble, everything is possible, we are all extraordinary! ‘Capacity is of paramount importance. But along with capacity, if one can invoke a higher consciousness, then one is likely to do very well. Again, we have to know that an increase in capacity comes quite often not only from regular training but also from the descent of Grace, which is part and parcel of a higher consciousness’. Man has always been a runner, a biped-miracle capable of running hundreds of kilometers in a single day and seemingly inexhaustible and limitless in potential. The Greek legend Yiannis Kouros ran 303 kilometers in 24 hours and 473 kms in 48 hours and was capable of running 200 kms daily for 10 straight days. Auckland’s own Sandra Barwick still holds multi-day records – including running 883.6 km on a track in six days; 1000 km on the road in seven days, and 1000 miles in twelve and a half days. Less known as a running nation, India last year attempted to change the perception about running in that country by organizing the ‘Great India Run’, the first multi-city ultra marathon, with 12 elite marathoners traversing through six states and covering a distance of 1480 kms from Delhi to Mumbai in 18 days. For thousands of years, cultures all over the world have used running as part of their cultural and spiritual expression. A new documentary by the Indian director Sanjay Rawal is set to explore these themes, with its film crew spending time with the Navajo Nation in Arizona, the famed running monks of Japan and the Kalahari bushmen in Botswana, as well as spending many days filming at last year’s 3100 Mile Race in New York city. Editing of the film has already started and in the last month, a Kickstarter project has already raised over $50,000 of its $75,000 goal, to enable the film makers to complete the film by August. Documentary director Rawal comments: “We wanted to learn about the deepest spiritual traditions of exceptional indigenous runners from around the world. We wondered if we could, first of all, find runners that actually embodied the ancient esoteric approach to running and then earn their trust. And so we hunted on the run with the bushmen of Botswana and filmed their ancestral way of hunting. We ran with champion Navajo runners versed by their elders in the spiritual traditions of running. And we embedded with the Japanese Marathon Monks to document their epic 1,000 day running journey where at one time the stakes were literally life or death. Once a generation they pick an athlete to run for 1000 days over 7 years, in 100 day chunks – up to 56 miles per day over mountain trails! 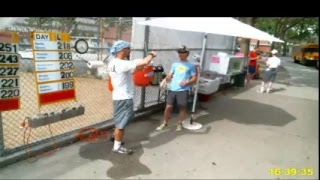 “Then we came across the most elusive, elite multi-day race in the world, the Self-Transcendence 3100 Mile Race, which takes place in Queens, New York City each summer and demands at least 59 miles a day for 52 straight days. While the participants of that race are for the most part Western, the event was founded by the Indian spiritual teacher Sri Chinmoy. In a sense, the race requires runners to tap into an ancient energy found in the most remote cultures of the world. We build the arc of the entire film around this race and bounce between remote, expedition-worthy locations to draw parallels between the approaches to running. We’re eagerly looking forward to this new documentary – ‘3100: Run and Become’ – which promises to be the definitive exploration of why ultra-runners do what they do”. Among other extraordinary running adventures: The Big Five marathon, Limpopo province, South Africa. Seemingly a traditional overland marathon – if not for the regular, freely roaming presence of the “big five” of African game: elephants, rhinos, leopards, buffalo and lions! The Man versus Horse marathon in Wales, inspired by a claim that runners could keep pace with horses. Horses proved the victors in every race until 2004, when a man named Huw Lobb won and took home a purse of £25,000, which had grown unclaimed every year since the race’s inception. Then there is the ‘Man carrying Wife’ 250 meter dash, originating in Finland and featuring three separate obstacles, one of which involves wading through a water course at least a meter deep with your spouse over your shoulders. The prize for winning? – the woman’s weight in beer! In the world championships, she sits on one end of a seesaw until the amount of beer evens it out. And on Saturday, May 7 in 2017, Nike sponsored an attempt by three elite marathoners – nurtured over a year of planning – to break the seemingly unassailable two-hour barrier for the marathon. This month, Kiwis Susan Marshall (408 miles) and Kim Allan (364 miles) came first and second in another challenging race, the just concluded Sri Chinmoy-inspired six day race in New York, a one mile loop around a flat, scenic trail in a pleasant park setting. Local Auckland runner 59 year old Durba Lee also competed, defying the usual constraints of age to cover over 243 miles. These races by the Sri Chinmoy Marathon Team feature an international field of runners who come to test their endurance, skill with pacing, and ability to recover from the stress of constantly moving. The competitors run with minimal sleep, all the while trying to accumulate as many miles as possible.